Empowering communities and enriching lives. For Cervus and our employees, thinking and acting locally is about more than helping our customers’ businesses. To us, it means helping entire communities thrive. Our ‘local first’ philosophy empowers individual dealerships to support local initiatives of their choosing – the people, charities and causes close to their homes and their hearts. Whether its coaching a recreational hockey team, mentoring a local 4-H Club, organizing a food bank drive, or volunteering at a neighborhood school, our stores’ efforts support important causes every year by donating time, resources and expertise. It’s how we stay connected to our neighborhoods and to the deeper meaning of the work we do. 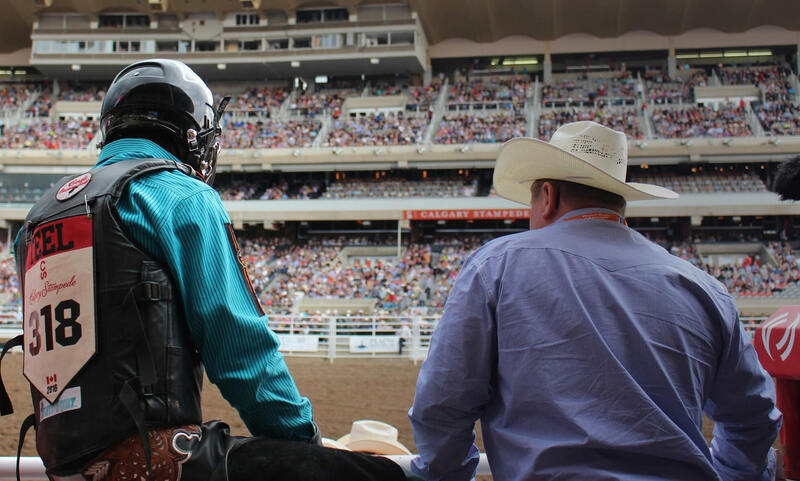 We’re a proud partner of the greatest outdoor show on earth: the Calgary Stampede. Steeped in tradition and committed to growth to enhance the local community, Cervus Equipment and the Calgary Stampede celebrate the people, animals, land, traditions and values that make up the unique spirit of the west. Since 2013, Cervus has been Trucking for a Cure. 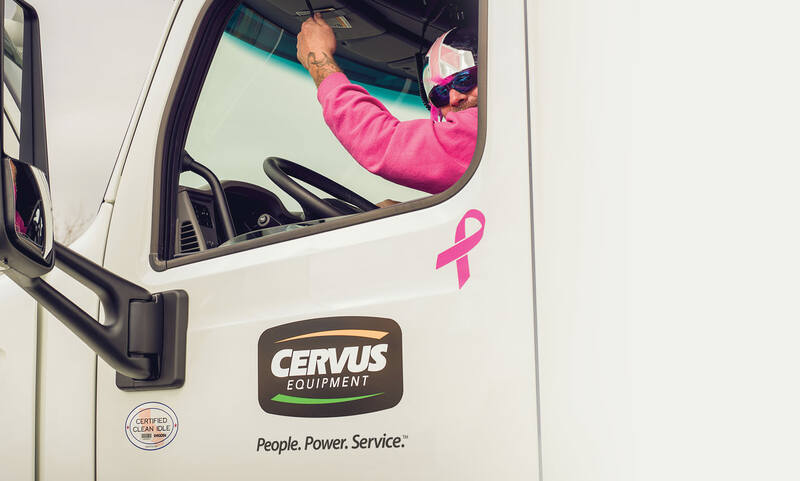 Each year, Cervus joins a convoy of passionate drivers, breast cancer survivors and supporters. Our pink spirit and Peterbilts take the highways by storm in the fight against cancer. With the dedication of Cervus employees and families, we have raised $25,000 for the Canadian Breast Cancer Foundation each consecutive year since 2013. As an advocate for leadership development, Cervus partners with 4-H Canada – one of the nation’s longest-running youth organizations. For over 100 years, 4-H Canada has led the development of strong youth leaders who are committed to positively impacting communities across Canada and around the world. Cervus Equipment is an advocate of supporting local Ag Societies that have been an active part of our communities for generations. We are proud to support the many activities including educational programs, events and services that bring our communities together. Drew Gregory is a country musician, John Deere fan and Cervus Equipment partner. He’s an outstanding member of the Cervus Family, bringing joy to members of our communities through his music. At Cervus, we believe in providing music to uplift and inspire our communities and customers. Cervus Equipment Peterbilt has been a proud supporter of Prairie Women on Snowmobiles for more than 15 years. Prairie Women on Snowmobiles have raised $2.3 million, contributing 100 percent of the funds to breast cancer research throughout Saskatchewan and all of Canada. The mental, emotional and physical strain that Canadian producers and farmers experience is more than that of the general population, yet it is rarely discussed. In partnering with Do More Ag, we're committed to supporting and strengthening Canadian agriculture. From British Columbia and Alberta to Saskatchewan, Manitoba and Ontario, we’re supporting food banks across Canada. We’re strongly committed to fighting hunger across the nation and are dedicating our time, resources – and even equipment – to the cause. Cervus knows the power sports play in the lives of our youth. It creates a sense of community, promotes teamwork, leadership, physical activity, hard work and dedication. It’s why Cervus supports over 60 youth sports across Canada. Touch-A-Truck is a family-friendly event that gives children the chance to sit behind the wheel of forklifts, UTVs, trucks and tractors. The event is in support of the Central Alberta Crime Prevention Centre, a community-driven initiative that works to reduce and prevent crime. Our two pink Raising Hope forkilfts are dedicated to raising breast cancer awareness and supporting local charities. Our forklifts helped lift 450,000 pounds of food as past of the Calgary Food Bank's city-wide food drive to fight hunger. Cervus Equipment is proud to support Professional Bull Fighter Scott Waye and advocate safety in profesional rodeos. Scott is a proud member of the Cervus Family, protecting hundreds of bull riders annually across many of Cervus’s sponsored rodeos. Cervus is proud to support John Walters on the World Professional Chuckwagon Association circuit. You'll see John tearing up the track in his chuck wagon at many of the Cervus sponsored rodeos. A genuine and humble guy, we’re proud to have John as a member of the Cervus Family.